I'm a regular reader of the New York Times. 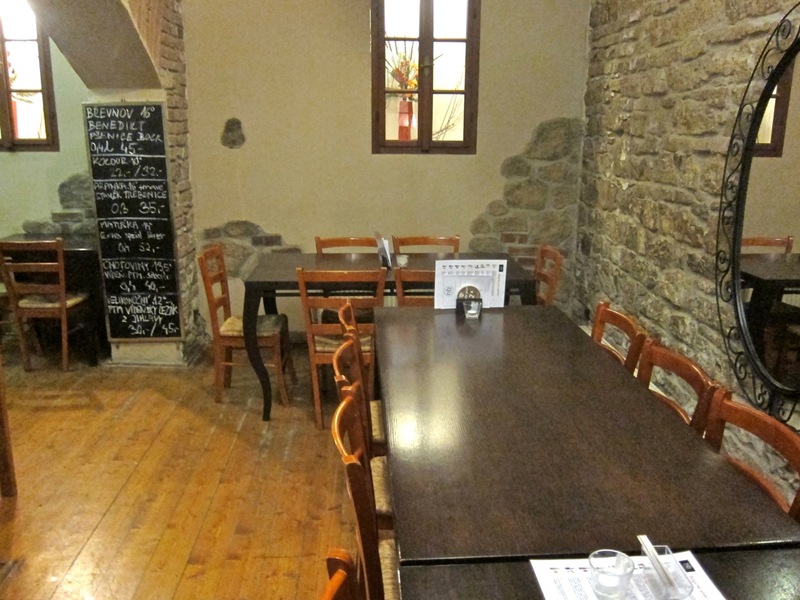 Occasionally, the "paper of record" records an article about a Prague restaurant for its travel section. Last summer, the newspaper published a brief review of Nota Bene, the new restaurant not far from I.P. Pavlova. The story mentioned the restaurant's "great beer" and "good food" prepared with "a playful blend of contemporary recipes and traditional flavors." Although I'm not a passionate connoisseur of Czech cuisine, I have eaten a lot of it over the years, and I do love Czech beer. The quality combination mentioned in the article piqued my interest. Then I heard and read stories about the restaurant's popularity making it hard to get a table and tales of sometimes surly service. I put the idea of a visit on my back burner. I finally got around to giving it a try. I visited three times in the last few weeks. For those who either can't get a table upstairs or just want to drink their interesting and tasty brews, there is their Beerpoint pub. 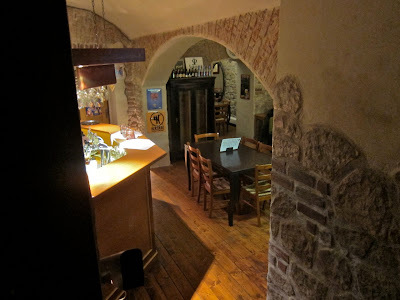 Walk through a passage and down some stairs and you'll find six regional Czech beers on tap, many of which you'd be hard-pressed to find elsewhere in this town. They also have some small meat and cheese snacks to go with the beers. The restaurant, which is non-smoking, is upstairs. 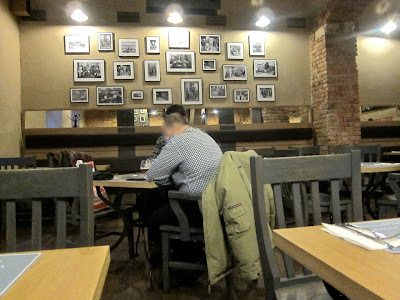 It's a smart-looking space with hardwood floors, brick walls, mirrors, and black and white photos on the walls. There are only about 15 tables and usually fill up fast or have reservation signs on them. I have one criticism of the design. The iron supports under the tables hit me in the knees, and I had to sit with my legs off to the side. There are also six beers on tap upstairs and the offerings are listed on chalkboards on the wall. Most are usually different from what is served downstairs. The kitchen prints up a new menu each day, usually with five main courses, a starter, a soup, and a dessert. Some but not all of the meats they serve come from The Real Meat Society. An earlier article on this site notes that they only sell free range meat from local farmers. On my first visit, I started off with a .4 liter of Nomad Gentlemen (48 CZK). This 11 degree ale had a light, crisp finish that reminded me of ginger. 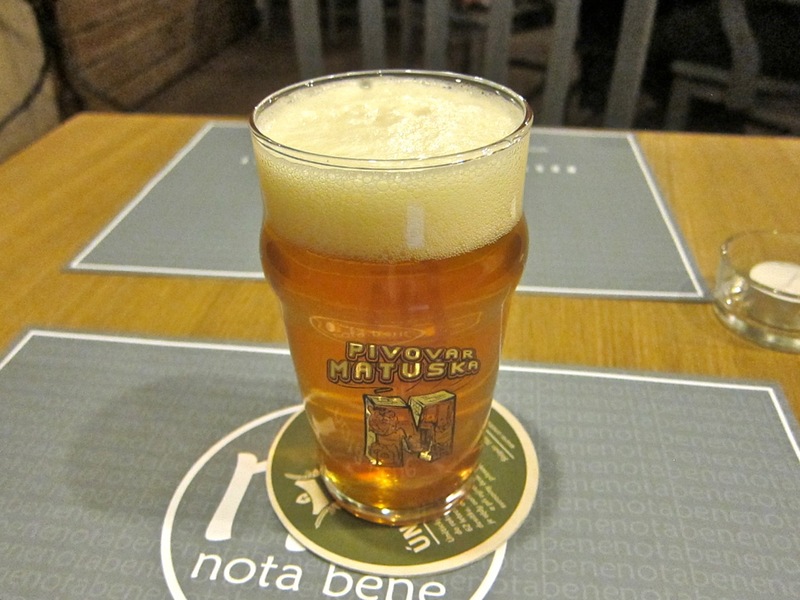 You do pay a premium for these rare beers, but I wish they were served in half-liter glasses. 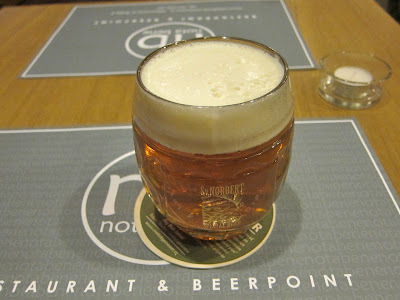 I didn't get a chance to sample some of the more exotic options like the De Molen Amarillo Imperial IPA from the Netherlands, which was 60 CZK for a .2 liter glass. For my meal, I saw one of my favorite Czech classics on the menu, the svíčková na smetaně, which basically translates as beef tenderloin on cream sauce (185 CZK). This was one of the better ones I've had. 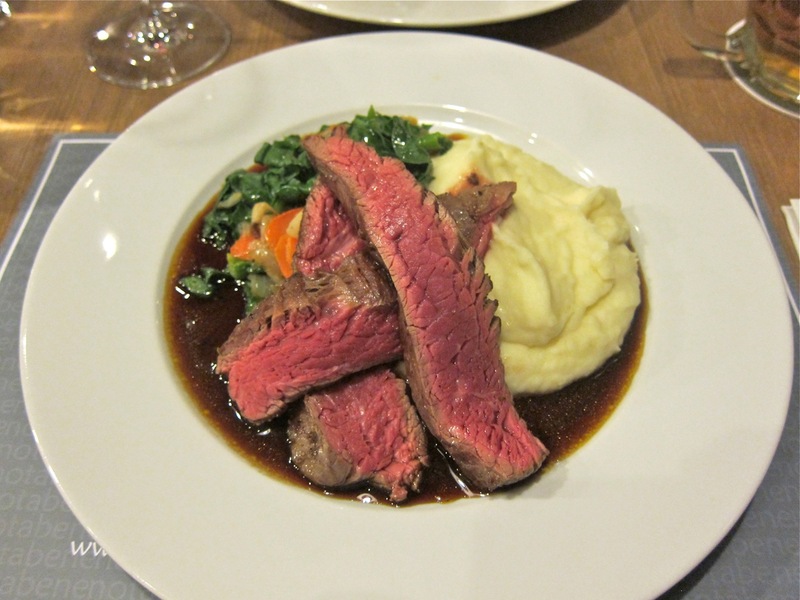 This dish is rarely, if ever, made with tenderloin and this one wasn't either. 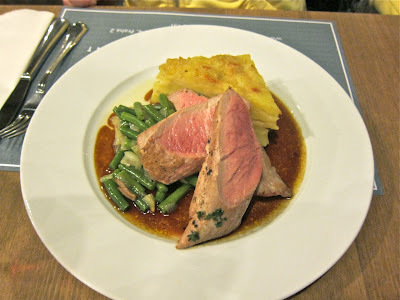 But it was a thick, slow-cooked, fork-tender and flavorful cut decadently studded with plenty of pork fat. All too often, the sauce is too sweet, too creamy, or both. This one was just right, with just a hint of sweetness and an inviting brown color indicating the rich base of vegetables. It was drizzled with a sweet cranberry sauce. I'm not a big dumpling fan, partly because I've had way too many stale ones in my life. These "Palffy" dumplings were the best I can remember in a long, long time. They were supremely fresh, delicate things full of flavor. These were the rare dumplings I could eat unadorned, but it was just so much better to coat them in sauce. It took a while for my dinner to arrive, but I understood that quality food can take time to prepare. This visit cost me 233 CZK and it felt like a bargain. On my second visit, I noticed the music playing lightly in the background: The Beatles, Beck, and "Raindrops Keep Fallin' on My Head" by B.J. Thomas. Quite a mix. I arrived just as they opened at 6 p.m. because I didn't reserve. I got one of the last unreserved tables. Due to some "technical problem," the menus for the evening were not printed for more than 30 minutes. A .4 liter glass of Matuska Winterbock (52 CZK) kept me busy while I waited. This 16 degree German Kellerbock packed a big, complex punch, but with only a lightly bitter finish. I later had a Nomad Gentleman. When the menu arrived, I quickly knew what I wanted. 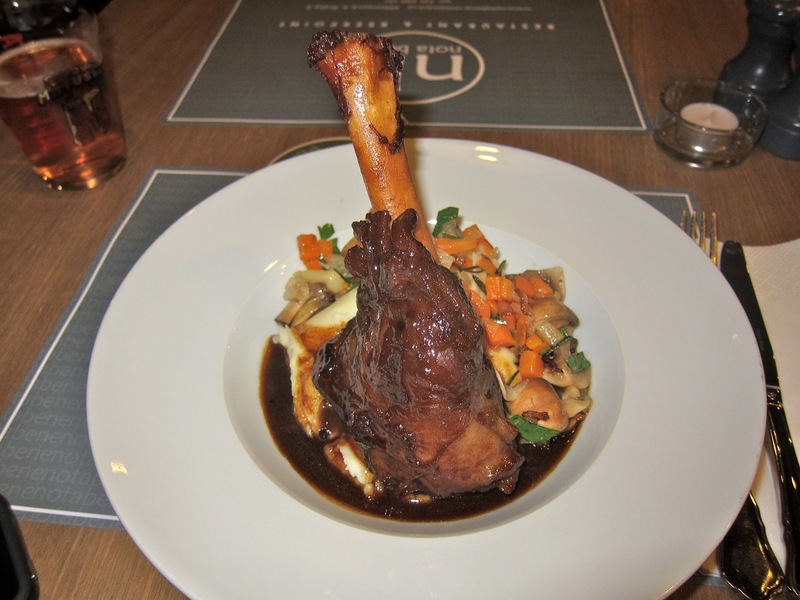 I ordered the lamb shank on red wine with mushrooms, vegetables, and mashed potatoes (345 CZK). As one would expect, the slow-cooked meat fell off the bone. After that, it was not as tender as I expected. The sauce was OK, but rather simple and one-dimensional. The mushrooms were dull and ordinary. The carrots, onions, parsley, and mashed potatoes were commendable. My impression was that this was a good, but not great dish. I had no big problem with it. But I expected better given the restaurant's reputation and the not insubstantial price tag. 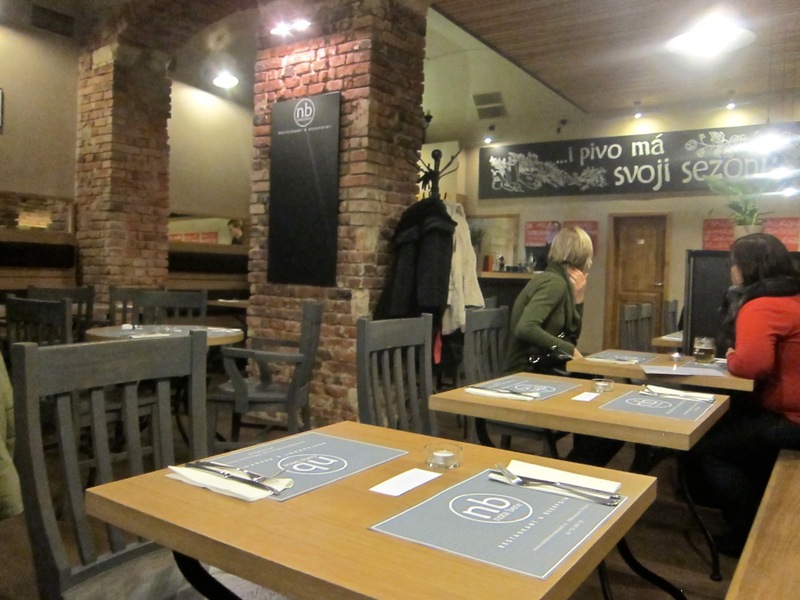 The whole meal was 445 CZK. I wasn't thrilled. A friend joined me on my last visit. 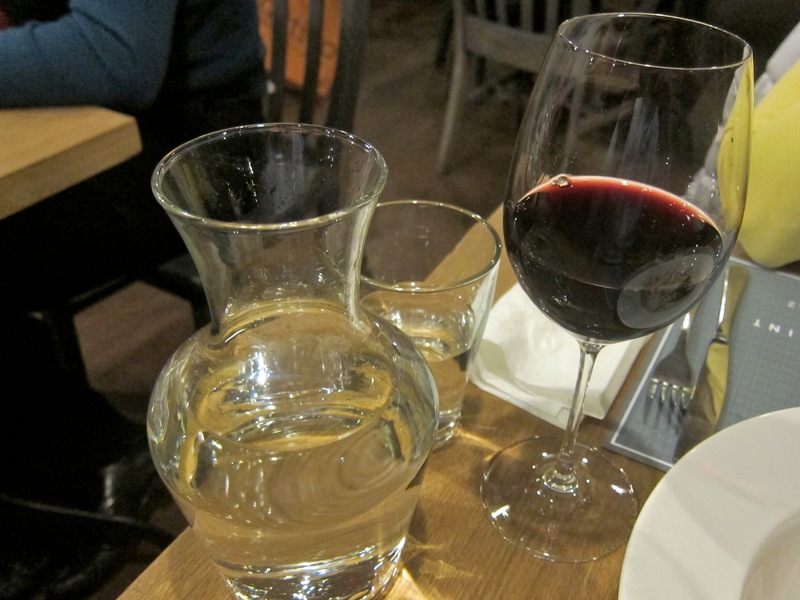 She had a French Cabernet (65 CZK/.1 liter), and said it was heavy and pretty good. 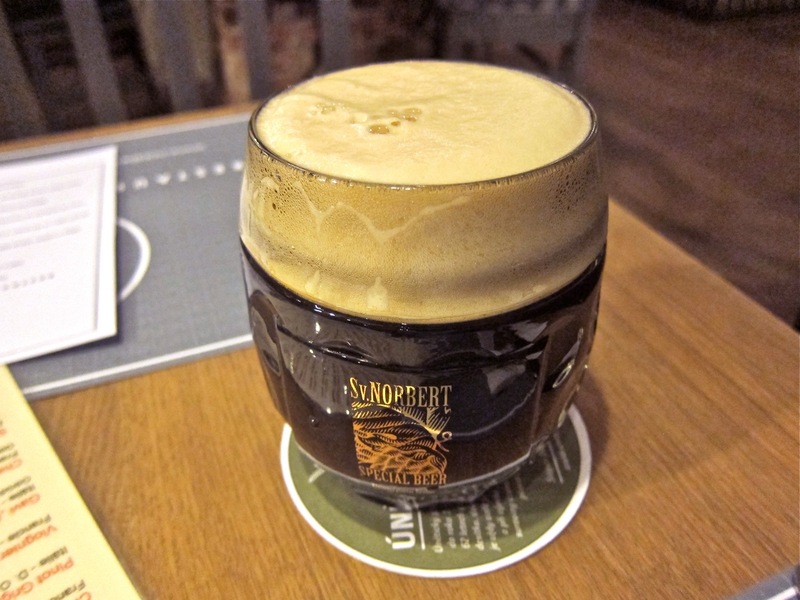 I had a .4 liter glass of Nomad Blackhawk 17 degree black IPA (52 CZK). My impressions -- blond head, great body, bitter, and alcoholic -- one of the few times you can appreciate this mix. 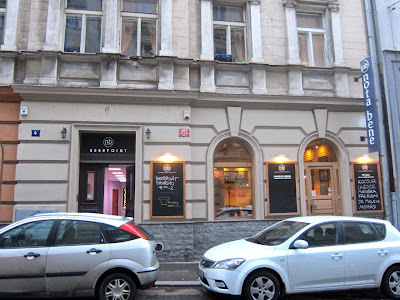 I got the smoked trout starter (125 CZK). The dense, cold fish was certainly smoky, but also a little dry. It was topped with tartar sauce made with chives. 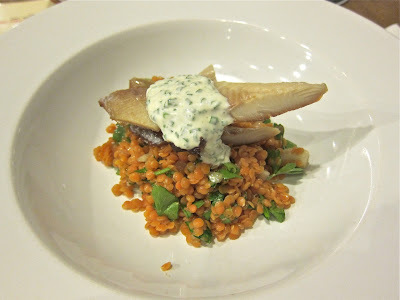 What really stood out was the cool, red lentils simply mixed with parsley and onions. That was delicious. For a main course, my friend got the pork tenderloin (265 CZK). The meat was silky, tender, and tasty and sat on a good gravy made with the pan drippings. The green beans were fine, but the scalloped potatoes were dry and lackluster. I ordered the flank steak (325 CZK). This was a major disappointment. I asked for it to be cooked medium rare, though it came out straight-up rare. That didn't bother me at all. What really let me down was that the meat was both bland and incredibly tough. I added a fair amount of salt, but I got tired of chewing it. My friend had a bite and didn't want another one. The spinach, carrots, and onions on the side were fresh and on the salty side. They balanced the beef out when combined on a fork. The mashed potatoes were good and creamy and I liked the gravy, which reminded me of a demi-glace. The bill for this meal was 994 CZK. Overall, the service was friendly to neutral and certainly not as rough as I was led to believe. I did get something of a cold reception when I showed up to dine solo without a reservation. 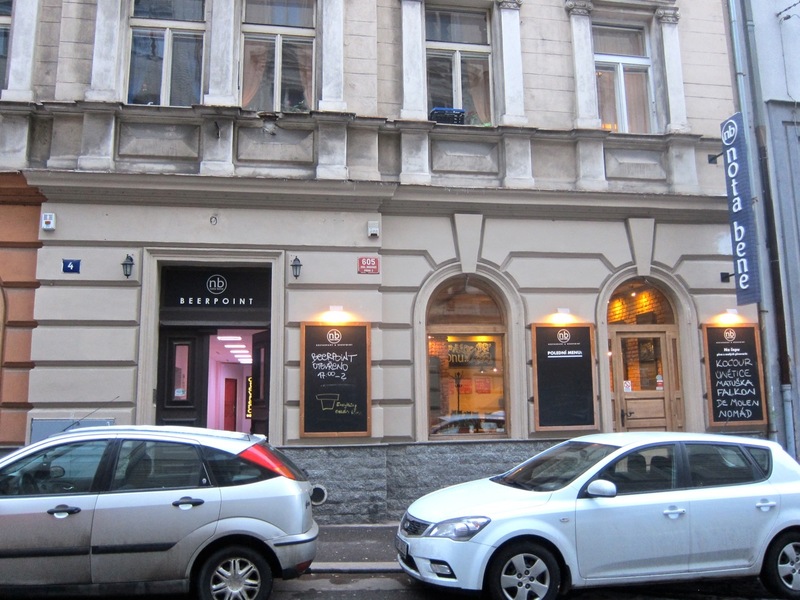 The kitchen can be slow, but it's clear they are putting more effort into the cooking that the standard Czech pub. However, I think there should be better results for that effort, not to mention the higher prices. Yes, I went in with high expectations about the food and, for the most part, they were not met. Note well: the food will not draw me back. I should be more skeptical about what I read in the newspaper. But I'd be more than happy to get drunk at Nota Bene. They have many fantastic beers to choose from. Good Review. Honest about the Food. Pity, because the Pivo. Looks Very Good. Is it a freshly opened place? I was in Prague several months ago but I didn't notice it and never even heard of it. 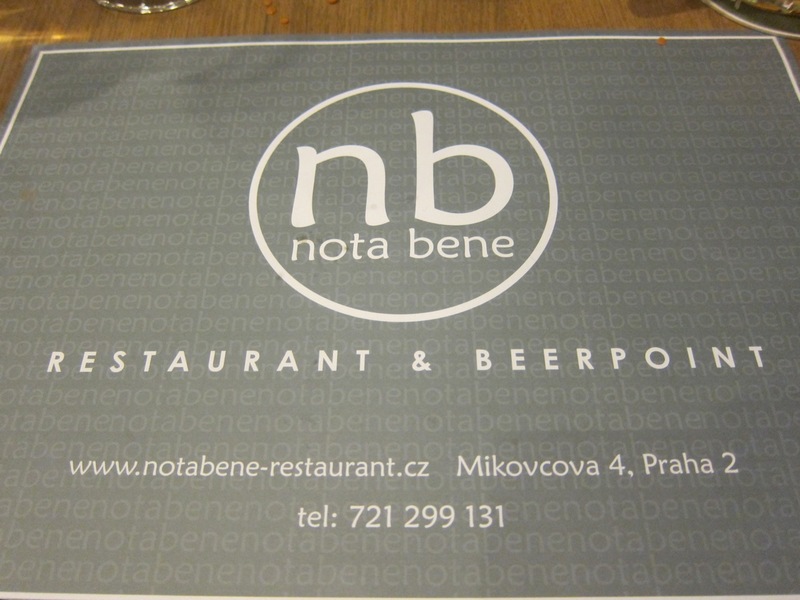 I have never tried Czech food, but your post is fantastic! I love the ambiance and exposed brick. The food looks well presented and scrumptious, especially the lamb shank, as I really love lamb. I wouldn't have thought that the tables might be uncomfortable to sit at, but when I read your description of the steel legs, I cringed...quite understandable. Thank you so much for sharing!